Alexandra Velasquez is in her fourth year as the Mariachi Director at John Jay High School. Under her direction, John Jay Mariachi Jalisco attended the MASBA State Mariachi finals for the first time in 2015. In 2016 the Mariachi received Best In Class, Superior Performance, and Grand Champion out of 29 total competing groups at Spring in the Park Music Festival, where they performed in the prestigious Morton H. Meyerson Symphony Center in Dallas, TX. The mariachi has received consistent Superior and Excellent ratings for UIL. Alexandra earned her Bachelor of Music degree in Music Education from the University of North Texas under the instruction of Dr. Nicolas Williams, Professor Dennis Fisher, and Dr. William Scharnberg. 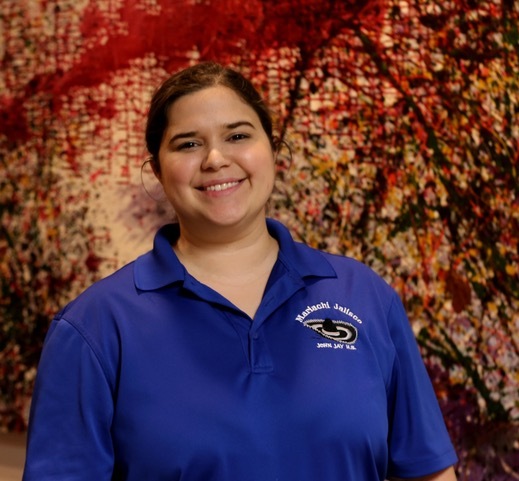 Mrs. Velasquez is a member of Texas Music Educators Association and the professional music fraternity Mu Phi Epsilon. She has a dog named Duncan, has been married for 5 years to her husband Ray, and welcomed a happy and healthy baby girl last year, Gabriella.